Egyptian Dermatology Online Journal 2 (2): 7,December 2006. * Department of Dermatology and Venereology –Faculty of medicine-Zagazig university. Background: pyruvic acid (CH 3 -CO-COOH), an α keto-acid has been recently formulated in a hydroethanolic vehicle at concentration of 40-70% for use as a superficial –medium peeling agent for the treatment of several dermatological diseases. Objective: the aim of this study was to evaluate the efficacy and tolerability of pyruvic acid as a chemical peel in the treatment of papulopustular acne, melasma and common warts. Methods: this study was conducted on 60 patients . Thirty patients affected by papulopustular acne, and 15 patients with melasma were treated with 40 -50% pyruvic acid every 2 weeks for a total of 1-3 months. Full clinical examination was done for all patients. The severity of acne was assessed by the Global Acne Grading System (GAGS), and of melasma by the Melasma Area Severity Index (MASI) before and after each session. The other 15 patients with common warts treated with pyruvic acid (70%) as a chemical paint twice daily for 2-3 weeks. Results: a highly significant decrease in the GAGS and MASI scores for patients with acne and melasma respectively was reported after treatment (p<0.001). Patients with epidermal type melasma demonstrated a better response to treatment than those with mixed and dermal type melasma (p<0.05). Complete clearing in all warts was achieved in 12 patients. Three patients showed improvement, but did not complete the study . No side effects were observed during or after treatment. Conclusion: peeling with pyruvic acid can be considered an effective, safe and well tolerated procedure in the treatment of patients affected by papulopustular acne, melasma and warts. Various chemical peeling agents have been used in the local treatment of mild to moderate papulopustular acne, either alone or in association with other therapies. A series of superficial chemical peels can give dramatic improvement in active acne over a short period of time  . Different therapeutic modalities have been used in the treatment of melasma. However, the optimal, cheap, and safe agent has not been discovered. Bleaching agents and chemical peels were the most frequently used methods in the treatment of melasma. Chemical peels have become established as the treatment of choice in melasma, especially in lighter complexioned individuals. Chemical peeling can be a modality to remove excess epidermal pigment in the epidermal and mixed types of melasma  . Treatment of common warts remains a therapeutic challenge for the dermatologists. Although 60% are estimated to resolve spontaneously within two years. There is no single treatment that is 100% effective and different types of treatment may be combined. Research into efficacy of treatment must take into account the possibility of spontaneous regression. The ideal aims of treatment of warts are: (i) to remove the wart with no recurrence; (ii) to produce no scars; and (iii) to induce life-long immunity . Pyruvic acid (CH 3 -CO-COOH), an α-keto-acid, has been recently used as a medium chemical peeling agent. Pyruvic acid has proven its efficacy for the treatment of many dermatological conditions such as acne, superficial scarring, photodamage, greasy skin, actinic keratosis, warts and pigmentary disorders . The aim of the present study was to evaluate the efficacy and safety of pyruvic acid in different concentrations (40-70%), as a chemical peeling in the treatment of papulopustular acne and melasma, and as a chemical paint in the treatment of common warts. Group A: Included 30 patients with papulopustular acne (27 females,3 males) . They were subjected to chemical peeling with pyruvic acid 40-50%. 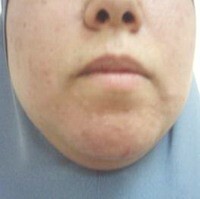 Group B: Included 15 patients with melasma (14 females,1 male) . They were subjected to chemical peeling with pyruvic acid 40-50%. Group C: Included 15 patients with common warts(9 females , 6 males). They were subjected to use pyruvic acid 70% as a chemical paint. Full history was taken from each case. Full clinical and dermatological examination was done. Any topical or systemic treatment was discontinued at least one month before the beginning of the study. The degree of acne severity was scored before and after each session using a global acne grading system (GAGS). This system divides the face, chest, and back into six areas (forehead, each cheek, nose, chin, and chest and back) and assigns a factor of 1, 2, or 3 to each area, based on size. Each type of lesion is given a value depending on severity: 0, No lesions; I, ≥ one comedone; 2, ≥ one papule; 3, ≥ one pustule; 4, ≥ one nodule. The score for each area is the product of the most severe lesion, multiplied by the area factor. These individual scores are then added to obtain the total score. A score of 1–18 is considered mild; 19–30, moderate; 31–38, severe; and > 39, very severe  . Woods’ light was done to differentiate between epidermal and dermal melasma. Melasma severity was scored before and after each session using melasma area and severity index (MASI). Where D is darkness, H is homogeneity, A is area, F is forehead, MR is right malar, ML is left malar, C is chin, and the values 0.3, 0.3, 0.3 and 0.1 are respective percentages of total facial area . Before the chemical peeling procedure , the skin was cleansed with cotton gauze soaked in 70% ethanol. Pyruvic acid (40% to 50% ) in a well-balanced water/ethanol solution was applied to the skin with a cotton tipped applicator for 2–4 min, starting at the forehead, continued to the cheeks, the chin and then the nose in a clockwise fashion with the entire application taking 30 seconds, until the appearance of erythema. Pyruvic acid was then inactivated by the application of a solution of 10% sodium bicarbonate in water. Treatments were repeated every 2 weeks for a total of 1- 3 months. Acne and melasma patients were initially treated with 40% pyruvic acid. Patients who showed evident erythema and/or white frost, desquamation and clinical improvement with the first two applications continued to be treated with 40% pyruvic acid, whereas patients who did not show these signs with 40% pyruvic acid were subsequently treated with 50% pyruvic acid. The post-treatment regimen consisted of cutaneous hydration and daily use of a high-spectrum sunscreen during the whole treatment period. Patients who suffering from warts applied a plain 70 % pyruvic acid formulation twice a day on the warts with the tip of a wooden tooth pick .The duration of treatment varies according to size of the lesion from 2-3 weeks. 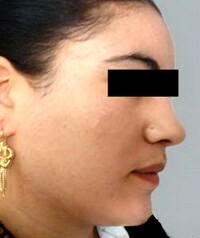 Follow-up evaluation of patients was done at 2 weeks intervals during peeling sessions and then monthly. At each visit, changes in clinical appearance were assessed. 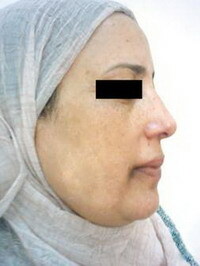 Photographs of right, left profiles and full face were taken for each patient before peeling, after each session and at the end of therapy to assess the improvement of lesions. Woods’ light examination confirmed the therapeutic efficacy of pyruvic acid . The number of sessions for each patient ranged from two to six depends on the patient satisfaction and the response of the treatment. Twenty seven patients (90%) were females and three patients (10%) were males, their ages ranged from (17 to 39 years) with a mean of 22.6 ± 5.2. The difference in the average GAGS score before and after treatment was statistically highly significant (P < 0.001) Table 1 . Very good response in the form of complete disappearance of comedones, papules and pustules was noticed in 10 patients (33.3%).Good response in the form of disappearance of more than 75% of lesions was noticed in 6 patients (20%) .Moderate response in the form of improvement of 50% - 75% of lesions and mild response in the form of improvement of less than 50% of lesions were noticed in 11 patients (36.7%) and 3 patients (10%) respectively (fig1,2,3) .There was a significant correlation between the degree of acne and the response to treatment (P<0.05). Patients with mild acne showed significantly better response to treatment than other types Table 2 . - P < 0.001 (Highly significant). Fourteen patients (93.3%) were females and one male patient (6.7%), their ages ranged from (25 to 50 years) with a mean of 36.2 ± 7.2. Family history of melasma was positive in 7 patients (46.7%) .Five patients (33.3%) had previous pregnancy and 3 patients (20%) had received oral contraceptive pills. Forty five percent of melasma patients showed exacerbation of melasma on exposure to sun. 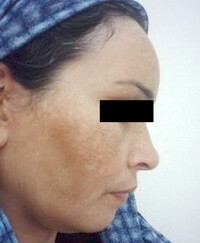 All patients had melasma for more than 2 years, and all of the cases were resistant to previous medical therapies. By wood’s light examination, 8 patients (53.3%) had epidermal melasma, 4 patients (26.7%) had dermal melasma and 3 patients had mixed melasma (20%). The difference in the average MASI score before and after treatment was statistically highly significant (P < 0.001) Table 3 . Good response in the form of improvement of more than 50% of melasma was noticed in 3 patients (20%) .Moderate response in the form of improvement of 25% - 50% of melasma was noticed in 5 patients (33.3%) .Five patients (33.3%) reported mild response in the form of improvement of less than 25% of melasma (fig4,5) . No response was observed in 2 patients (13.4%) . There was a significant correlation between the degree of improvement and type of melasma . Patients with epidermal type of melasma showed significantly better response to treatment than other types Table 4 . - P < 0.001 (Highly significant) . P < 0.05 (significant ). Nine patients (60%) were females and six patients (40%) were males, their age ranged from (7 to 45 years) with a mean of 25.8 ± 11.5 . Total clearing in all warts was achieved in 12 patients (80%) and verified by physical examination (fig 6) . Three patients (20%) showed improvement, but were lost to follow up. 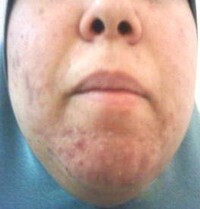 Fig 6 A: Patient with common warts before treatment. 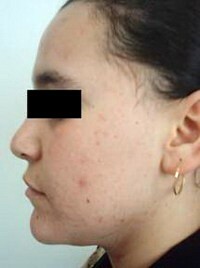 Fig 6 B: Patient with common warts after treatment with pyruvic acid 70%. Chemical peeling with pyruvic acid was well-tolerated by all patients, and no immediate or late side-effects were observed. Application of sodium bicarbonate 10% solution quickly removes the burning sensation, although erythema generally persists for a few hours after peeling. Application of pyruvic acid is followed by a very mild desquamation, persisting for 7–10 days after peeling, which does not seem to interfere with the patient's social life. Several properties of pyruvic acid make it particularly effective as a topical peeling agent. At the epidermal level, application of pyruvic acid in concentrations ranging from 40% to 70% induces keratinocyte detachment , epidermolysis and thinning of the upper epidermal layers. At the dermal level, pyruvic acid has been demonstrated to cause an increase in production of collagen, elastic fibers and glycoproteins. Pyruvic acid also has sebostatic and antimicrobial activities  . Finally, the chemical equilibrium with lactic acid under physiological conditions makes pyruvic acid a particularly effective and well-tolerated peeling agent . Pyruvic acid is an α - keto acid .α-keto-acids are less hydrophilic than α-hydroxy-acids because the –C=O group has a lower affinity for water molecules than the –OH group of α-hydroxy-acids. Thus, pyruvic acid is well suited for treating greasy surfaces, such as the skin . The effect of pyruvic acid depends on the concentration used and the duration of application before neutralization. Lower concentrations of pyruvic acid, ranging between 40% and 70% in a well-balanced proportion between water and ethanol, and short-term applications (2–4 min) are currently used to obtain a superficial-medium peeling . A wide variety of agents have been shown to be effective for superficial peeling: α-Hydroxy acid, Jessner's solution, resorcinol, and trichloroacetic acid (TCA) are commonly used in-office peel compounds . A series of superficial chemical peels can give dramatic improvement in active acne over a short period of time [11,12]. In this study, pyruvic acid 40-50% was used as a chemical peeling agent on 30 patients with papulopustular acne. The results showed that the average GAGS decrease was 73.7% and it was highly significant (P<0.001) . 33.3% of patients showed very good response , 20% of patients showed good response , 36.7% of patients showed moderate response , while 10% of patients showed mild response. Pyruvic acid was well tolerated by all patients, and no immediate or late side effects was observed. Our study showed pyruvic acid was effective in reducing both inflammatory and noninflammatory acne lesions. These anti-inflammatory and comedolytic properties make it a very useful peel . There is no reported use of pyruvic acid peeling in acne except one report .C otellessa et al. observed a significant improvement of the mild to moderate papulopustular acne after pyruvic acid peel with an overall improvement of acneic lesions in 90% of cases. Our result was in agreement with that of his study and we proved the efficacy of pyruvic acid not only in the treatment of mild to moderate acne but also in the severe form . Pyruvic acid has a strong comedolytic effect because of its lipophilic nature. Lipophilic agent can penetrate the milieu of the sebaceous unit; therefore, lipophilicity is important for comedolysis . These antimicrobial and comedolytic properties make it a very useful peel in patients with acne. On the other hand, α-hydroxy acids are hydrophilic and do not have anti-inflammatory properties. Thus, their activity in the treatment of acne is not as great, nor do they produce peeling in oily-complected individuals . Chemical peels have become established as the treatment of choice in melasma, especially in lighter complexioned individuals [14,15]. As previously reported [16,17,18] , most of our melasma patients were females. This is a natural phenomenon because of the female hormonal activity during pregnancy together with the use of contraceptive pills was reported to exacerbate melasma. In agreement with previous reports [19,20] the family history of melasma patients suggests the importance of genetic factors, pregnancy and sun exposure in the pathogenesis of this condition . In our study the decrease in the mean MASI score was 3.5 and it was highly significant (P<0.001) . 20% of melasma patients showed good response , 33.3% of patients showed moderate response , 33.3% of patients showed mild response, while 13.4% of patients showed no response. As expected a better response was observed in patients with epidermal-type compared to mixed-type melasma. 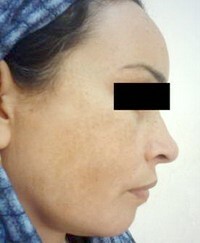 Mild or no response was observed in the patients with dermal-type melasma. To our knowledge this is the first report about using pyruvic acid as a topical peeling agent in treatment of melasma. Most of the previous experience with α-hydroxy acids peels in melasma was limited to glycolic acid , which reported to be effective . Most patients treated previously with glycolic acid chemical peels were skin types II–III [21,22]. Whereas, in our study, all patients treated with pyruvic acid were skin types IV–V according to Fitzpatrick classification. Interestingly, all recruited patients tolerated pyruvic acid chemical peel. In studies with glycolic acid peel , the decrease in the mean MASI score was 8.6. The time needed to achieve an acceptable cosmetic response was comparable to that in these studies. Pre-treatment was used in the form of topical tretinoin 0.05% and a sunscreen with a sun protection factor of 15 applied daily by all patients for 1-2 weeks. Similarly, postpeel treatment was tretinoin 0.05% and hydroquinone 4% applied after the first 24 hours after peel [21,22]. Whereas in our study, no pre- or postpeel treatments were used , only a sunscreen was applied. These differences in the pre- and postpeel treatments should be considered in the comparison of both studies because pyruvic acid chemical peel was proved to be an effective modality in melasma with no pre- or postpeel treatment. Sharquie et al.,  used full-strength lactic acid solution 92% as a peeling agent every 3 weeks. Our results differed notably from the result reported by them as they found that the decrease in the mean MASI was 7.9. This could be attributed to the fact that their patients had epidermal melasma only. Also there is seasonal and racial variation and most of the year is sunny in our country. Some of their patients complained of discomfort or redness of the face . Compared to lactic acid peel, pyruvic acid peel was found to be less irritating and better tolerated. Pyruvic acid peels are well accepted by patients because of the very limited discomfort in the postpeel period. Erythema lasts for only 15 minutes after the peeling procedure, and desquamation, if it occurs, is usually very slight. We did not observe any case of persistent erythema as well as any case of post-inflammatory hyperpigmentation. Pyruvic acid differentiated from other peeling agents, such as salicylic acid, which cause erythema, dryness, desquamation of the treated areas and crusting . Kuwahara and Rasberry  reported that pigmentary changes and prolonged erythema were the most common complications following chemical peel with glycolic acid 70%. 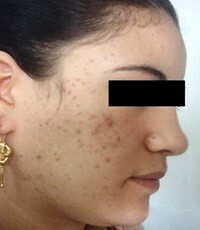 Hyperpigmentation is the commonly observed side effect with superficial peels especially with TCA, in people living in tropical countries with intense ultraviolet exposure, such as India . Our study proved the efficacy of chemical peel with pyruvic acid 40-50% in the treatment of melasma. However, the results of peeling were too much promising in papulopustular acne than that of melasma. Many different treatment modalities of common warts exist including various destructive and immunotherapeutic modalities. Destructive therapies include topical salicylic acid, podophyllin, cryotherapy, photodynamic therapy, laser therapy and bleomycin injection , while immunotherapies include oral cimitidine, contact sensitization, imiquimod, topical tacrolimus & pimecrolimus and intralesional immunotherapy [26,27]. In the present study ,after application of pyruvic acid, the wart became slightly whitish in color and the superficial layer peeled off indicating a keratolytic effect. Although 70% pyruvic acid is caustic, careful application over the wart area only prevents its harmful effects on the skin. pyruvic acid application for warts was safe and effective, with minimal side-effects. pyruvic acid is economical and does not require any sophisticated equipment. It is painless, can be used in children, and also for the treatment of periungual warts. It does not require any local anesthesia and scarring is minimal. Among the various caustic acids used in the treatment of common warts, salicylic acid is the weakest, trichloroacetic acid is of medium strength, and bichloroacetic acid is the strongest. Pyruvic acid is stronger than salicylic acid, but less caustic than trichloroacetic acid. The mechanism of action of salicylic acid in warts involves keratolysis of virally infected tissues  . Trichloroacetic acid and bichloroacetic acid are powerful irritants that work by hydrolyzing the cellular proteins, leading to inflammation and cell death . There is only one report by Halasz,  about using pyruvic acid 70% with or without added 5 – fluorouracil in the treatment of warts . Overall ,64% of his patients treated with either of the two formulations experienced complete clearing of their lesions after daily use. Our result was in agreement with the previous result and total clearing in all warts was achieved in 12 patients (80%). No severe or serious adverse events were documented during the treatment time. No erythema, edema or scaring have been reported in our study. In conclusion , patient selection is very important in obtaining the best results. The full face repeated chemical peeling using 40-50% pyruvic acid is a safe and effective therapy for management of papulopustular acne and melasma. According to this study, eradication of melasma completely is very difficult. In our community and due to our climate, the regular exposure to ultraviolet rays with the long summer time, darker skin type, high priced sunscreens as regards income are great obstacles for permanent melasma cure. For that we currently continuing following patients of acne and melasma to maintain the obtained results . In our view this may also act as a prophylaxis from recurrence . Consequently w e believe that 70% pyruvic acid application can serve as a safe, cheap, and effective alternative in the treatment of common warts. 1. Cotellessa, C., Manunta, T., Ghersetich, I., et al. : The use of pyruvic acid in the treatment of acne. J.Eur. Acad. Dermatol.Venereol; 18 , 3 , 275-278, 2004. 2. 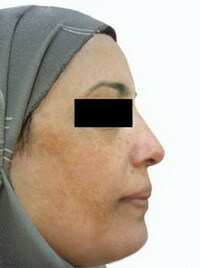 Sharquie, K.E., Al-Tikreety, M. M. and Al-Mashadani, S.A.: Lactic acid as a new theraputic peeling agent in melasma. Dermatol. Surg. ; 31: 149-154, 2005. 3. Sterling , J.C., Handfield-Jones, S. and Hudson, P.M.: Guidelines for management of cutaneous warts. Br. J. Dermatol. ; 144(1): 4-11, 2001. 4. Berardesca, E ., Cameli, N ., Primavera, G ., et al. : Clinical and instrumental evaluation of skin improvement after treatment with a new 50% pyruvic Acid peel. Dermatol. Surg. ;32(4):526-531, 2006. 5. Doshi, A., Zaheer, A. and Stiller, M.J.: A comparison of current acne grading systems and proposal of a novel system. Int. J. Dermatol. ; 36:416 –418, 1997. 6. Kimbrough-Green, C.K., Griffiths, C.E., Finkel, L.J., et al. : Topical retinoic acid for melasma in black patients. Arch. Dermatol. ; 130 : 727-733, . 1994. 7. Griffin, T.D., Van Scott, E.J. and Maddin, S: The use of pyruvic acid as a chemical peeling agent. J. Dermatol. Surg. Oncol. ;15:1316–1320, 1989. 8. Van Scott, E.J. and Yu, R.J.: Alpha hydroxy acids: therapeutic potentials. Can. J. Dermatol. ; 1: 108–112, 1989. 9. Ghersetich, I., Brazzini, B., Perist, K., et al. : Pyruvic acid peels for the treatment of photoaging. Dermatol. surg. ; 30 (1):32-36, 2004. 10. Brody, H.J. : Chemical Peeling. New York : Mosby Year Book, 33–50, 1992. 11. Baumann, L.: Cosmetic Dermatology. New York : McGraw-Hill, 173–186, 2002. 12. Layton , M.: A review on the treatment of acne vulgaris. Inter. J. of Clinical Practice. 60(1) ; 64-72, 2006. 13. Kligman, A.M.: A comparative evaluation of a novel low-strength salicylic acid cream and glycolic acid products on human skin. Cosmet.Dermatol. ;10:11S–15S, 1997. 14. Grimes, P.: Melasma. Etiologic and Therapeutic Considerations. Arch. Dermatol. ; 131: 1453-1457, 1995. 15. Javaheri, S.M., Handa, S., Kaur, I. et al. : Safety and efficacy of glycolic acid facial peel in Indian women with melasma. Int. J. Dermatol.40:354–357, 2001. 16. Nouri, K., Bownes, L., Chatier, T., et al. : Combination treatment of melasma with pulsed CO2 laser followed by Q-switched alexandrite laser: A pilot study. Dermatol. Surg. ; 25(6) : 494-497, 1999. 17. Manaloto, R. and Alster, T.: Erbium: YAG laser resurfacing for refractory melasma. Dermatol. Surg. ; 25(2) : 121-123, 1999. 18. Hurley , M.E. , Guevara, I.L., Gonzales, R.M.,et al. 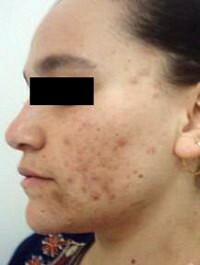 : Efficacy of glycolic acid peels in the treatment of melasma. Arch. Dermatol; 138:1578–1582, 2002. 19. Pathak, M.A., Fitzpatrick, T.B. and Kraus, E.W. : Usefulness of Retinoic acid in the treatment of melasma. J. Am. Acad. Dermatol., vol 15, Issue 4 Pt 2, pp: 894-899, 1986. 20. Jimbow, K. and Minamitsuji, Y.: Topical therapies for melasma and disorders of hyperpigmentation. Dermatol. Therap ; 14 : 35-39 , 2001 . 21. Cunliffe, and Holland, K.T. : Clinical and laboratory studies on the treatment with 20% azelaic acid cream for acne. Acta. Derm.Venereol. ;143:31–34, 1989. 22. Lawrence , N., Cox, S.E., and Brody, H.J. : Treatment of melasma with Jessner's solution versus glycolic acid: A comparison of clinical efficacy and evaluation of the predictive ability of Wood's light examination. J. Am. Acad. Dermatol; 36: 589-593, 1997. 23. Lee, H. and Kim, H.: Salicylic Acid Peels for the Treatment of Acne Vulgaris in Asian Patients. Dermatol.Surg. ; 29 ; 1196-1199, 2003. 24. Kuwahara, R.T. and Rasberry, B.: Chemical peel. Emedicine. http://www.emedicine.com/derm/topic533.htm : 1-11, 2005. 25. Kilkenny, M., Merlin K ., Plunkett A ., et al. : The prevalence of common skin conditions in Australian school students: 3. acne vulgaris. Br. J. Dermatol. ;139:840-845, 1998. 26. D ayall-Smith, D.J. : Treatment of warts at the turn of the new millennium. Aust. J. Dermatol., 41:1, 2000. 27. Horn, T.D., Johnson, S.M., Helm, R.M., et al. : Intralesional immunotherapy of warts with Mumps, Candida, Trichophyton skin test antigen. Arch. Dermatol. ; 141(5) : 589-594, . 2005. 28. Goldfarb, M.T., Gupta, A.K., Gupta, A.M., et al. : Therapy for human papilloma virus infection in nongenital sites. Dermatol. Clin. ; 9(2): 287-296, 1991. 29. Zhu, W.Y., Blauvelt, A., Goldstein, B.A., et al. : Detection with the polymerase chain reaction of human papillomavirus DNA in condylomata accuminata treated in vitro with liquid nitrogen, trichloroacetic acid and podophyllin. J. Am. Acad. Dermatol; 26 (5 Pt 1):710-714 , 1992. 30. Halasz, C.L. : Treatment of warts with topical pyruvic acid with and without added 5-fluorouracil. Cutis. ; 62: 283-285, . 1998.